In 2018 Xiaomi decided to launch the two Android One smartphone, There is less expensive and lite version of Xiaomi Mi A2. Which is loaded with few compromising specs. 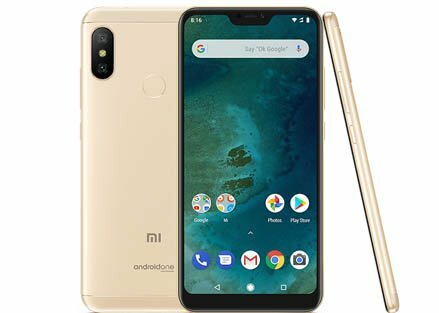 Xiaomi Mi A2 Lite has 5.84 inches FHD+ display, Android 8.1 (Oreo) OS, Snapdragon 625 processor, Dual 12+5 MP Primary | 5 MP Secondary camera, 32/64 GB Internal | 256 GB SD card support | 2/3 GB RAM and 4000 mAh battery. The phone has a Metallic body with sleek and secure grip and 2.5D glass display curves smoothly and gently into the metal body that it feels compact and fit in your hand. 5.84 inches IPS LCD capacitive touchscreen is showing the visuals with brilliant colours. 1080 x 2280 pixels resolutions of a display having a 19:9 ratio covers the maximum area and enhances the viewing experience. visuals are better with the clarity of 432 pixels per inch and the brilliance of 84% NTSC color. The 12MP + 5MP dual camera with a depth sensor is AI-powered for enhanced photography capabilities. Dual camera setup taking the picture with bokeh effects that blurs the background and sharpen edges. The camera also has Beautify 4.0, deep learning algorithm determines your distinct features to accentuate your natural beauty. The rear camera also supports EIS for better stability in videography. 5 MP front camera which also supports HDR mode takes decent selfies. The Qualcomm Snapdragon 625 with 14nm technology strikes an excellent balance between performance and power consumption. It is power efficient chipset ensures smooth gaming without burning through your battery Keep using your phone for all day with a huge 4000mAh battery that Plays music up to 34 hours and has the talk time of 19.5 hours (using 3G network) on a single charge. A dedicated slot Slot for SD Card. 5.84 inches Crystal clear Infinity display. Infrared and 3.5mm audio jack is available. Android One OS with no bloatware. No LED flash for the 5MP selfie camera. Quick Charge 3.0 is not supported. NFC (Near Field Communication) not supported.